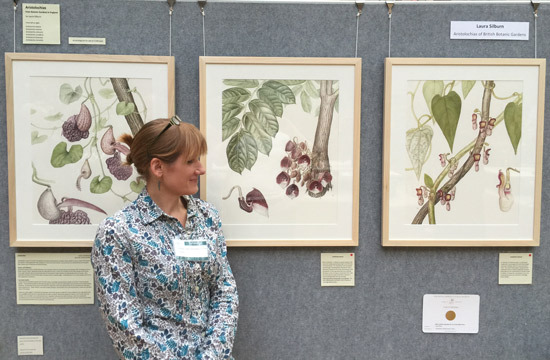 This week three artists won RHS Gold Medals for their Botanical Art at the Royal Horticultural Society's Shades of Autumn Show in the Lindley Hall in London. 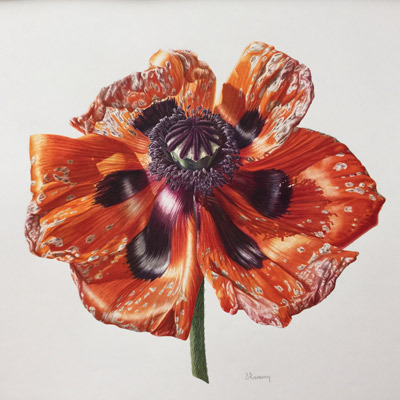 Denise Ramsay (Hong Kong / France) - Papaver orientale - Oriental Poppy. Denise Ramsay was a first time RHS exhibitor - and sold her first painting to Dr Shirley Sherwood at the show. This was before she also sold the rest of her series to Dr Sherwood after the show! Her series of six paintings - A Brilliant Life - of Papaver Orientale is extraordinarily impressive. Her paintings are so well constructed and have enormous impact. They paintings almost appear as if they are 3D. Prior to completing her suite of work she had studied, via distance learning, for the Society of Botanical Artist's Diploma in Botanical Illustration and gained a Distinction. Laura Silburn (Cornwall, England) - Aristolochias of British Botanic Gardens. I first met Laura Silburn in April 2013 when she won her first Gold Medal for Varieties of Hardy Geranium that have received the RHS Award of Garden Merit. 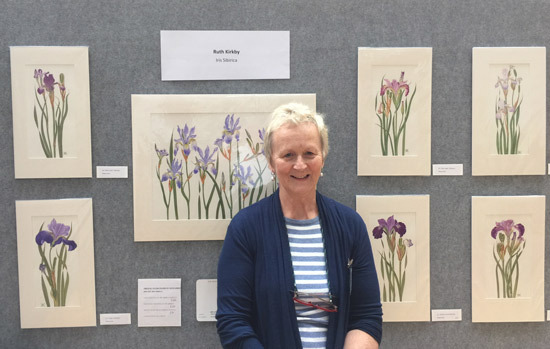 Laura is a Fellow of the Eden Project Florilegium Society and after her first Gold Medal she started to painted Aristolochias for the Society. 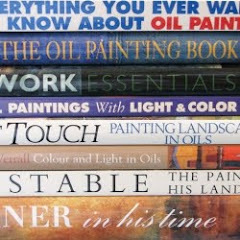 She loved painting them so much she started looking for some more and started to contact other Botanic Gardens in Cambridge and Oxford. Aristolochias use a pollination trap mechanism in order to use insects to pollinate their flowers. They have evolved weird and wonderful flowers in order to do this. Often mimicking carrion, they look bizarre, some say sinister, but I find them captivating. 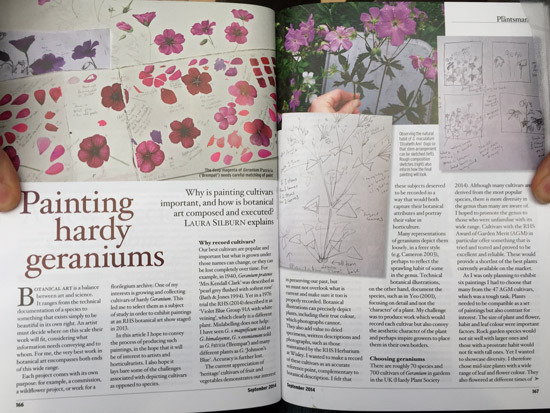 Check out an article by Laura in the September 2014 edition of The Plantsman - Painting Hardy Geraniums (pdf file) is available to read online or download from the RHS website. 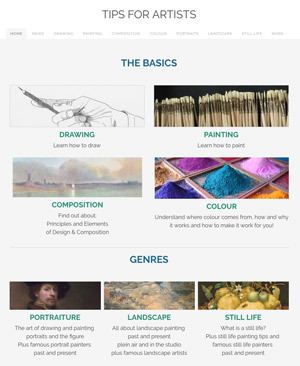 In this she explains her working practices and how she develops her artwork from measurements, drawings of how the plant is constructed, sketches and thumbnails and colour samples to the finished painting. 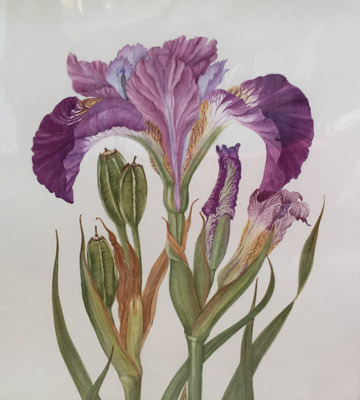 Ruth Kirkby (Powys, Wales) - Iris sibirica - Siberian Iris. Ruth has exhibited with the RHS previously, winning silver medals on both occasions. 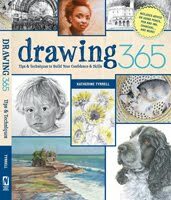 However she has only been painting botanical art for four years and is mostly self-taught. Her display was very 'quiet' compared to some of the others but very impressive for all that. Yet More "Top Tips" for winning an RHS Gold Medal! Regular readers will know that over the past few years, I've asked all the RHS Gold Medallists (exhibiting in London) over the past few years for tips and techniques with respect to both the creation of their exhibit and its presentation. Here are a few more. 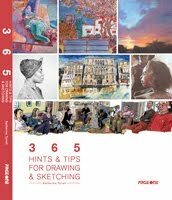 You can find links to previous "top tips" from the Gold Medallists at previous exhibitions listed at the end. 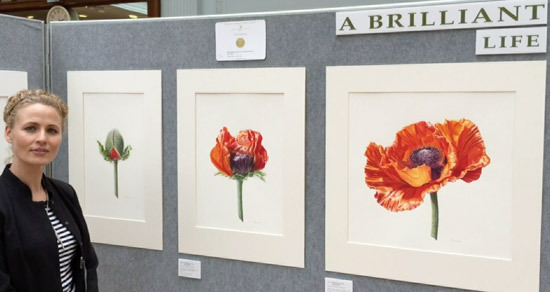 One of the comments I heard from a few exhibitors is that Judges are encouraging innovation and looking for high standards of contemporary botanical art. I guess I've got this one labelled as "The Rory McEwen Factor" - how can you advance the art of botanical art? 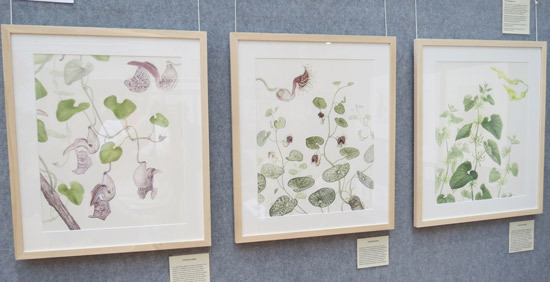 For example, I think Denise's series is an excellent example of how to tell the botanical story of a plant over six paintings rather than showing all the elements of its life in one painting. Working out what plants or species to tackle and then how to approach it is probably one of the most challenging parts of the process of creating an RHS Exhibit. Don't under-estimate the amount of time needed to think this through prior to making a choice. In general two years are required for a submission. You need a complete life cycle - and the plants need to "perform" re flowering and fruiting. It's possible to do it in one cycle but two years makes it easier to maximise your chances of the best possible result. Gold Medal winners emphasised that there's a lot of preparatory work involved in putting a submission together. In Laura's opinion, by the time you sit down to start the paintings you're probably already halfway through the project in terms of the hours of work for the entire project. There's no point in having perfect brushstrokes if composition is no good or you're not showing the parts of the plant which matters. Finding quality plants can be a challenge. Two great sources are Botanic Gardens and National Plant Collections - used by two of the Gold Medallists at this show. All of the Irises in Ruth's exhibit came from the same place - Aulden Farm which hosts the National Collection of Siberian Irises. The farm in Herefordshire is very close to where Ruth lives in Powys - just across the border in Wales. This made it much easier to come and go to collect specimens. Ruth emphasised that the specimens she has painted are a small proportion of those available. Why not check out whether you have any National Collections of Plants located close to where you live? Ruth Kirkby's paintings were all one panel. Interestingly she kept the external dimensions identical for all paintings - and then varied the internal dimensions. There are some very subtle differences in margins - however the same external size for the six smaller paintings gives them a much better unity and better presentation across the exhibit as a whole. I recommend that you always think about the overall presentation and the size of the painting and how it will be matted BEFORE you start to paint. Ruth had painted ten paintings and was able to bring the best seven to the show. If you have the time and you are dedicated to pursuing a particular species it's great if you can select the best of those you have painted to take to the RHS Show. Artists can sell their artwork at this exhibition. Ruth's smaller works were selling well - and in part that was probably because of the price. 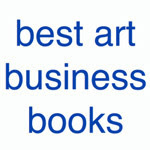 Pricing for art varies around the country and naturally varies between different sizes. 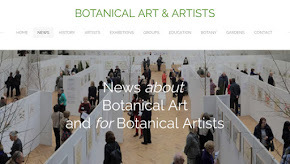 Do some research about prices typically paid top notch botanical art sells for in London - or enjoy giving botanical art collectors a bargain! 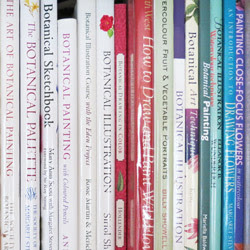 A lot of botanical artists are self-taught. At least two of the Gold Medallists at this show have had the benefit of being taught by tutors who are themselves RHS Gold Medal winners and who can recognise whether their student has reached the standard of work which merits applying for a place in an RHS Botanical art Exhibition. 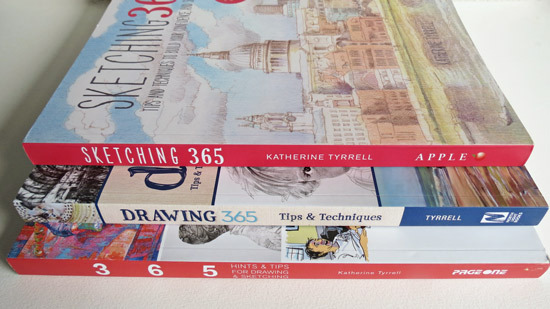 Both Denise and Ruth were encouraged by their tutors to make a submission. Thank you, thank you, thank you Katherine for posting this excellent post. 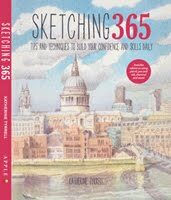 It is so informative and has really helped me to visualise the botanical treats that I missed this year. So gutted to have missed out, but you have really filled the void and for that I am truly grateful. The video is a spectacularly good idea. A big well done to Denise who's work BLOWS MY MIND!. So proud of her for doing this so quickly after graduation. A well deserved medal. Keep up the good work Katherine.